Video poker has become a favorite of online casino enthusiasts in recent years, and this is true with Canadian players as well. The reason for this is probably because video poker maintains a really good balance of interest, skill, and fast-paced action in one game. Video poker is really easy to understand and play, and also has a good level of interaction to it that makes it a lot of fun. You can also learn about the game and get better as you play which gives you even more incentive to try and win more. Video poker exists in a number of different formats and variations so there’s also a lot to explore once you get a feel for the basic versions of the game. Choose the credit denomination. Click the arrow or +/- buttons to decide how much each credit is worth. Place a bet. Decide how much you wish to bet on each hand. Keep in mind that video poker machines are more likely to pay out jackpots when you are betting the maximum amounts. This isn’t affected by the credit size you choose. Build your hand. Once you hit “Deal” you’ll see your hand of 5 cards. Now it’s up to you to choose which cards to hold and which to replace. Aim for one of the winning hands that appear in the game’s pay table. Click the cards you wish to keep and then hit “Draw”. Get your new cards. If you’re lucky and held the right cards, your new cards will have helped you reach a winning hand. Well done! Bonus Rounds. Some video poker games have bonus rounds that let you go double-or-nothing on your winnings. You reach the bonus round by hitting a winning hand. In the bonus round, one card will be face up. Your task will be to pick a card that is higher than the face card. A win is a win. If you have a winning hand, don’t be greedy and try for a bigger win. Collect your winnings and move on to the next hand. Stick with the basics. Games with a lot of wild cards might attract you with bells and whistles, but will often require a higher minimum hand for you to score a win. Start with a single hand. Don’t play the multiple hands games until you get a good feel for the single hands. Always play for fun. If you’re working up a sweat, worrying about your balance, or start getting annoyed by a string of losses, just take a break. You’re meant to be having fun! Understand the paytable. Paytables vary per game. Games that pay more for certain hands are of course better than those that pay less. Bet max. Even if you’re using minimum credit amounts, always bet the maximum amount. Wild Cards – Wild cards can take the value of other cards in order to help you reach a winning hand. Auto-Holding – Many video poker games will give you the option to let the game recommend which cards you should hold onto. Gamble/Bonus Round – Some video poker games will offer you the chance to go double-or-nothing on your winnings when you’ve reached a winning hand. This is done with a high-low card guessing game. Level Up – Some video poker games will reward you for stringing together your winning hands. This is great if you like playing the long game. By hitting winning hand combinations, you can reach higher levels with better payouts. Minimum Hand – This refers to the lowest value hand you need to win a payout from a game. In the popular “Jacks or Better” game, a pair of jacks or higher value hand is the minimum hand you need to have to win money. 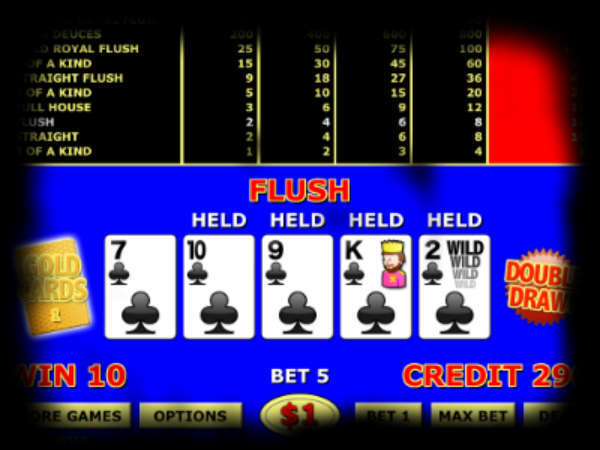 Single Hand – In single hand video poker games, you are dealt one hand at a time. We recommend single hand games for beginners. Multi-Hand – These games deal multiple hands at once. This makes the game much faster, but can also be a bit too much for new players. Once you’re ready, multi-hand poker games can be a lot of fun. Video poker has become a staple of any online casino. Both single-hand and multi-hand video poker games are a lot of fun to play and the control of the game makes it feel very interactive. There are game strategies for playing video poker and we will perhaps write an article outlining these strategies in one of our forthcoming articles, but learning strategies isn’t a necessity to win and you can still enjoy the game without them.